When gazing at travel brochures of the Christkindlemarkt held in Germany during the holiday season, you can’t help but wish you were there amongst the quaint shops and picturesque cityscape doing your gift shopping. Well, wishes do come true this holiday season! Peoples Natural Gas, together with the Pittsburgh Downtown Partnership, have worked to bring those charming holiday markets to you with the first Peoples Gas Holiday Market. 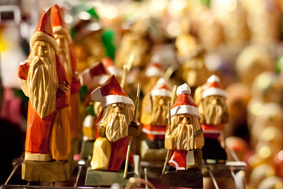 Inspired by the original Christkindlemarkt created in 1545 in Nuremberg, Germany, and the Christkindlmarket in Chicago, the Peoples Gas Holiday Market is located in Market Square in Downtown Pittsburgh and offers a one-of-a-kind shopping experience to area residents. It is sure to become the city’s holiday hot spot. When you think Germany and Christmas, you also think food. Little Bavaria offers favorites such as apple cider, strudels, dumplings and soft pretzels, and the restaurants surrounding the square are open and feature a variety of cuisines that will satisfy hungry shoppers. 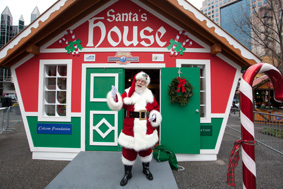 One of the highlights of an excursion to the Peoples Gas Holiday Market is Santa’s House. A specially designed home fit for the Jolly Old Elf himself, complete with a fireplace and 8-foot decorated Christmas tree, delights the children and all those grown children who still keep Christmas in their hearts. If you bring a non-perishable food item or make a cash donation benefiting the Greater Pittsburgh Community Food Bank, you may have your photo taken with Santa for free. The Pittsburgh Parking Authority has designated every Saturday through December 22 a free-parking day in Downtown Pittsburgh. For those traveling from the North Hills area, an alternate, convenient way to get to the market is to park on the North Shore and then take the T for one stop to Gateway Center. The Peoples Gas Holiday Market is a two minute walk from the T stop. The market debuted on Saturday, Nov. 24, and will be open seven days a week through Sunday, Dec. 23. Hours are Monday-Friday 11 a.m. to 8 p.m., Saturday 11 a.m. to 9 p.m. and Sunday 11 a.m. – 6 p.m. For more information on the Peoples Gas Holiday Market, visit: http://www.downtownpittsburgh.com and click on the Peoples Gas Holiday Market button.